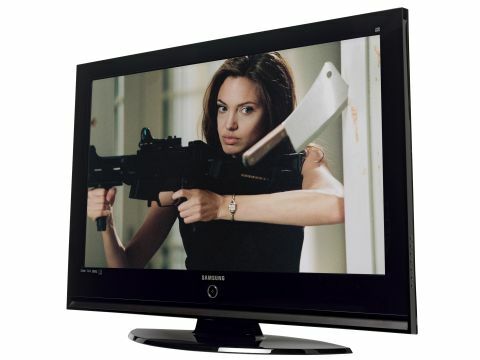 Plasma screen makers have spent thousands of pounds promoting the benefits of the technology (better blacks and superior motion resolution). Korean flat panel king Samsung aggressively supports both LCD and plasma, so it's an intriguing prospect to compare the PS-42P7HD with the company's 40-inch LCDs - because as LCD screen sizes grow larger, plasma has had to work harder to earn its corn. Samsung's recent flat TV range has won numerous awards and turned countless heads with its sensational aesthetics. The PS-42P7HD is made of the same stuff, with an ultra-glossy, minimalistic black bezel/stand and sleek, angled, silver strip along the bottom edge. Connectivity is slick too. Twin HDMIs tick the digital HD box, and are backed up with a component video input for that Xbox 360. Plus there's a D-Sub PC input, a couple of Scarts, and both a 9-in-2 slot arrangement and a USB port for direct playback of MP3, JPEG and MPEG-4 files. Plus you get all the customary lower quality AV options. The technology bouquet is high. The silicon includes Samsung's Smooth Motion Driver, which calculates and inserts up to 10 extra frames per second for crisper and smoother motion. The TV also comes with Digital Natural Image processing, which covers colour richness and tone, motion handling, fine detail and contrast. Filter Bright technology, meanwhile, helps stop the screen suffering from ambient light reflections and boosts perceived contrast levels. The set features a built-in digital tuner, complete with 7-day Electronic Programme Guide support - though this EPG only lets you scroll along it in puny two-hour segments. This is not ideal if you're looking for something seven days ahead. Feeding the 42P7HD a variety of HD and standard-def sources produces a generally likeable performance. Particularly impressive are its noiseless pictures. Moving objects, like footballers during both standard- and high-definition football matches, appear free of dotting noise. What's more, camera pans showed no sign of the fuzzing and blur witnessed on comparably-sized LCDs. MPEG noise in general is noticeable only by its absence. Black level is also rather good. The screen claims an impressive contrast ratio of 10000:1 (actually measured by our Tech Lab as a reasonable 420:1). This is borne out by some striking, deep blacks practically devoid of the grey or blue overtones of other LCD TVs. This nicely adds tension during the dark factory level of Gears of War on the Xbox 360. The darkness makes the locations feel more convincing and threatening. Also very good is the 42P7HD's sharpness. The scrap around Vernita Green's house in Kill Bill Volume 1, (from Sky HD) for instance, is gorgeously clear and detailed. The quality of the Smooth Motion Driver is such that even the very fast action doesn't lead to any obvious sharpness-reducing processing artefacts. There are a couple of areas where the 42P7HD falls short of admittedly more expensive PDPs from Pioneer and Panasonic. First, the deep black level lacks greyscale subtlety. I also noted that colours during SD viewing occasionally look unnatural, with an orangey look to reds and flesh tones, and a greenish tone to peak whites. But these traits are either small or sporadic enough not to count as serious black marks on a great picture. Sonically, the TV is simply functional. It continues Samsung's current penchant for 'hiding' down firing speakers along the bottom edge of the screen, but, as usual this leads to a soundstage which sounds congested and one-dimensional. Plasma is alive and well in the form of the PS-42P7HD. Its picture quality is not only better than you've any right to expect for £1,500, but also better for home cinema viewing than the brand's similarly-sized LCD products. A great value choice.